When the misogynists and the misandrists eat each other. the image itself is an abomination, but I didn't expect the answers to be even worse. 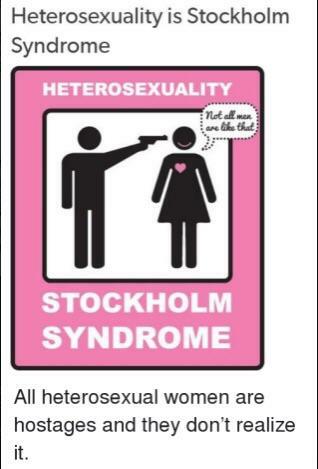 Heterosexuality is Stockholm Syndrome. All heterosexual women are hostages and they don't realize it. But what about heterosexual men? Let radfems/femcels and incels have each other. They deserve each other, living miserably ever after. Just make sure to sterilise them both. I don't want to know just how messed up a child raised by an incel and a radfem would be. Political lesbians, homophobis posters and MRAs: sexist fight! r/CringeAnarchy lately went full alt-Right. What does being Bisexual mean in this context?